Here's some cute hand-made gingerbread men that I've been recently making. I sell most of these online on ebay rather than in my craft booth at the local co-op. Not sure why more tend to sell online, but they do. And in case ya'll wanna give a batch a try, here's how I make'em. Okay, you'll wanna gather your supplies. You can either make this out of a self hardening clay (which is ready to go) or salt dough that you'll have to make and bake. Here's my cinnamon salt dough recipe if ya'll need it. NOTE: Not needed if you are using a clay that self hardens. I mix it all up in a bowl, adding a bit more of water, if needed. It should be firm but still good and flexible. Knead it for a bit and get it all mixed good. If you want colored dough, you could easily add food coloring or something natural like coffee or tea. 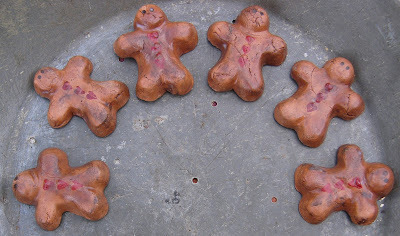 When it's ready and easy to manage, I take out a candy mold with the gingerbread men shapes. Keep in mind this craft is endless with shape opportunities! Thankfully, I am a collector of candy and cookie molds. Just press in the amount of salt dough or clay needed into your shapes, no coating spray needed inside, by the way. It just makes them sticky. Press firmly, trying to get out all air pockets and wrinkles in your mix. And then easily pop them back out. As seen, I've found that the clear plastic candy molds work best. This way you can see it as you are molding them. If you used self hardening clay, just sit them aside and let them dry for 24 hours then decorate. Look close, not all of them come out perfect. But that's okay with primitive crafts. I like some a bit different and older looking. Then it's time to stick them in the preheated oven at 300* for about 45 minutes. Sometimes more, sometimes less. It mostly depends on the thickness of the salt dough. The just take them out and let them cool. Here's how I finished my batch above off after they dried. I took some apple barrel paint in burnt umber, a very wet paper towel, and dabbed it on the gingerbread man. The added water gives it an old appearance when it dries. Take a closer look at what I mean. Oh, and I had also taken some burgundy red and dabbed on some cute heart buttons down the front. And two little dots for eyes. And to seal them, I used some basic, off brand, elmer's glue. I had to cut a slot in my bottle cause my top was glued shut and would not even twist off for nothing. That's why I have duct tape on it below. To seal up my cut. lol. Put a good amount on it but don't make it too thick, it will gaum up. Here they are staring to dry. They will appear a lot darker. But they lighted up as they dry. Here's a batch of some cute little gingerbread men ready to go for crafting needs or decorations. They also look cute sitting around in a bowl as bowl fillers with cinnamon sticks and such. EACH MEASURE approximately: 1.5 inches in height each x 1.5 inches in width each. And just think how cute these would be as bigger ones! You can even put a hole in them before they dry to use as hanging Christmas ornaments or tag add-ons to spruce up gifts! 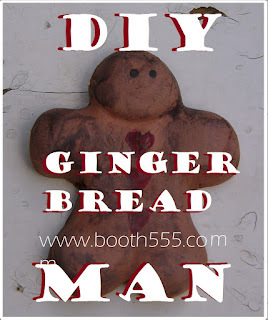 Endless ideas for the little Ginger Bread Men! And when I can keep them in stock, you can find them here online if ya need some. Hope ya'll liked this little Ginger Bread man craft! They are adorable. A great tutorial.